2015, ISSN (Online) 1869-2737, ISSN (Print) 1869-2729, de Gruyter, Berlin and New York, 123 p.
This paper analyzes the debate on nuclear power after the Fukushima accident by using a text-mining approach. Texts are taken from the editorial articles of five major Japanese newspapers, Asahi Shinbun, Mainichi Shinbun, Nikkei Shinbun, Sankei Shinbun and Yomiuri Shinbun. After elucidating their different views on nuclear power policy, including general issues such as radiation risks, renewable energy and lessons from the meltdown, the paper reveals two main strands of arguments. Newspapers in favor of denuclearization appeal to “democratic values.” They advocate public participation in decisions on future energy policy and criticize the closed-off administration of nuclear energy. Meanwhile, pro-nuclear newspapers adopt a “technological nationalistic” stance, claiming that denuclearization will weaken Japan’s superiority in the field of nuclear power technology. In other words, the debate about the nuclear power is not merely about energy supply, but also about the choices facing Japanese society over visions for the future after the events of Fukushima. Literary self-translation is a practice that has gained increasing scholarly attention in the fields of postcolonial, transnational studies and translation studies, following the rise in the number of bilingual and plurilingual writers over the twentieth and twenty-first century. In the Japanese context, a growing body of research on works by authors who write in more than one language is now calling for an acknowledgment of how bilingual literature has been “shaking” the foundations of modern Japanese literature, as Komori (1998) suggests, by breaking the equation between nationality, ethnicity, national language and culture that had been developed during the nation-building process in the late nineteenth and early twentieth century. In this paper, I analyze the work of Sekiguchi Ryōko, a contemporary poet based in France, who writes free-verse poetry in Japanese and self-translates it into French. In the first part, the paper examines a poem included in the collections Hakkōsei Diapositive (Japanese) and Calque (French) to illustrate how Sekiguchi conceives self-translation as a process that destabilizes the categories of original and translation. Addressing questions of authenticity and fidelity, Sekiguchi seeks to explore the creative potential of translation as a means to reconsider one’s affiliation to the mother tongue. 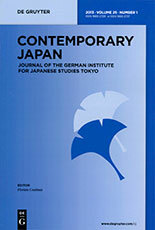 In the second part, the paper focuses on Sekiguchi’s multilingual public readings, arguing that they offer alternative ways of thinking about translation, communication and linguistic identities, for they stress the need to foster an understanding of languages as historically positioned systems, but also encourage readers to step outside normative linguistic paradigms. This paper takes a look at the juku [cram school] landscape of an area in the urban outskirts of Osaka. In Japan, juku represent a major part of out-ofschool supplementary education. As educational businesses outside the realm of formal schooling, they provide services aimed towards answering diverse educational needs. As a market, juku display large revenues, which shows their economic impact and considerable breadth of services. As has been discussed both in domestic and overseas studies, one of their main functions is to prepare students for entrance exams for the next higher level of education. However, the strong connection implied by existing research between juku and the entrance examination system has hindered a more detailed understanding of their roles in Japanese education. This paper presents research based on semi-structured interviews with representatives of six juku in Osaka. Providing insights into the strategies used to secure students, it will be shown how juku go beyond improving their students’ academic abilities by offering individualised services that have a strong element of “care” to them. The recent political turmoil challenges one to study the function and form of the post-war Japanese political parties. The obvious differences in the spatial and temporal contexts do not change the fact that many of the organizational behavioral patterns that are topical in the analysis of the current situation can be found in the parties that were established during the erratic years following Japan’s defeat. With a focus on intra-party relations and on the multilayered institutional environment in which the political parties operate, this article focuses on Hokkaido, a region which analysts of Japanese political parties have often ignored. While demonstrating (a) the interconnectedness of different spheres in the political system, (b) the varying roles of central party organs in the development of local party branches, and (c) the personal relations prevailing over the official organizational channels, the analysis of the control and granting of autonomy pays special attention to the first gubernatorial elections in Hokkaido. This is because the electoral competitions and the creation of electoral products are recognized as moments when the relations between local branches and central leadership are defined. This paper compares the travelogues of two contemporary zainichi Korean writers: Kenari mo hana, sakura mo hana [Forsythias are flowers, cherry blossoms too] by Megumu Sagisawa (1994) and Pyonyan no natsuyasumi: Watashi ga mita Kitachōsen [Summer vacation in Pyongyang: The way I’ve seen North Korea] by Miri Yu (2011). Sagisawa recalls her experiences as a foreign student in Seoul in 1993. Yu describes three visits to North Korea between 2008 and 2010. The aim of this paper is to examine the literary identity of the two writers and develop this notion into a more specific critical device. As the analysis shows, Yu describes a scenery of North Korea that is appropriate for the portrayal of herself to others, while Sagisawa tries to form a self between Japan and South Korea. Identity here is a sense of belonging with respect to the question what group to connect with. Sagisawa wonders whether to assign herself to the pre-existing category of the zainichi kyoppo [Korean nationals in Japan]. She creates a story about the search of herself, in which her identity is subject to change during the narrative. By contrast, Yu creates the Korean peninsula as her homeland in the literary space. She presents a uniform self-image that remains unchanged by the dynamics of the narrative. This paper examines how sub-Saharan Africans in Japan challenge three Japanese societal convictions: the myth of Japanese homogeneity, ideas concerning contemporary blackness, and inclusivity into Japanese self-identity. The analysis is based on participant-observation fieldwork and in-depth interviews with members of Japan’s African communities. As will be shown below, the particular conditions surrounding African migration are notably different from those of other minority groups in Japan. The African population embodies a phenotypically disparate population that has settled in Japan and engages in work within the core of mainstream society. Additionally, in contrast to other minority groups, African-Japanese children lack a strong ethnic consciousness. As a result it is increasingly likely they will demand greater acceptance into mainstream Japanese identity, thereby questioning some of the essential criteria of what it means to be Japanese.